LinkedIn remains one of the most powerful social media channels for B2B marketers and its importance continues to grow. Organic reach on LinkedIn remains at full throttle and the majority of LinkedIn users are the decision makers in their respective businesses. LinkedIn offers two account options: 1) Personal Profile and 2) Company Page. You have several ways of interacting on your Personal Profile Page. You can share an update or you can like, share, or comment on one of your connection’s updates. The later shows you to be a caring business partner. In addition, your name and profile photo are now attached to that update which is visible to both your and your connection’s network. When posting an update, remember to include an image which will help draw attention to your update. To create a Company page, you first must have a completed Personal Profile. You will also need a “domain based” email address for the Company Page you’re creating. (Example: john@yourcompany.com) Make sure too that your company is listed under the ‘Experience’ section on your Personal Profile. Your Company Page is where you will share information about your company’s current promotions or upcoming special events and promote what makes you different or better than your competition. Your Company Page should be professionally branded with the consistent look and feel of your website and other social media channels. You’ll want to encourage LinkedIn users to ‘follow’ your company page. This is done by promoting your page via newsletters, printed materials, other social media channels or good old-fashioned email. To gain wider exposure for your Company Page posts, you can ‘like’ the update when it shows up on your Personal Profile Page’s newsfeed. This is a non-selling/humble way of getting this update in front of your 1st level connections and it allows them the opportunity to share it with their connections. You don’t want to ‘like’ every Company Update you post on your Personal Profile Page as this can get a little annoying and predictable. Be selective on the updates you choose to bring into your personal LinkedIn pipeline. A great way to expose your brand beyond your current LinkedIn connections is to Join A Group. There are groups for most every industry and interest so finding one to join should be easy. Once a member, you gain immediate contact access to group members and a portal to share your knowledge with professionals outside your current network. If you are currently not very active on LinkedIn but want to be, start slow. On your Personal Profile Page, begin with maybe posting one update per week and one like/share/comment per day. After a month or so, you can ramp up to a more normal schedule. Of course, what’s normal is unique to everyone but my suggestion is posting an update no more than once a day to your Personal Profile Page and like/share/comment on someone else’s update no more than two or three times a day. As for your Company Page, start with maybe one post per week and after 30 days expand to two or three posts per week. The secret to building a solid LinkedIn reputation for you and your company is to be helpful, humble and consistent (and not become an irritant because you’re posting too often or sales pitching too much). Your LinkedIn connections can choose to block your updates, or even worse, remove you as a connection. You don’t want either! If you need a consultation about SEO or Web Design, our company, Make It Loud, can at the very least help you to discover if SEO or a good website fits into your budget. It doesn’t cost anything to find out and we’d be honored to serve you, face to face when geographically possible. 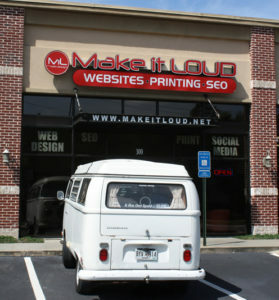 Feel free to contact us by email at: info@makeitloud.net, visit our website at: www.makeitloud.net, or call us at: 678.325.4007. Even if you’re not local to Gwinnett or Atlanta, we’d be happy to do an assessment.